You don't have to have a plan to be apart of the social media craze. The best thing to do is jump in for a few weeks/months and call it research. Then step back and outline your strategy. At Omnipress we have been active with many association groups, lists, twitter'ers, linkedIn, etc. Now we're planning the right strategy to get our entire team (10 peeps) involved. Each in different groups with some overlap, but not single site saturation. Then each month, we will discuss what's working, what's not and help each other. There's a ton a great resources being shared by the social media-ites. You can jump in and dance with them or just sit in the corner and watch and let me tell you... it's more fun on the floor. When you initially jump in - did you do it as an individual versus organizationally? What did you learn. what questions did you want to answer from your "research"? Now that you're bringing your team along, what questions are you asking? 1. 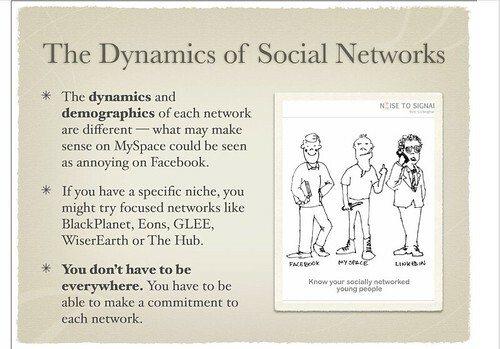 What social networks should we establish our presence on? DEPENDS ON YOUR AUDIENCE. YOU NEED TO DO RESEARCH AND FIND WHERE YOUR TARGET IS TALKING. USE BLOGSEARCHS AND POST QUESTIONS TO YOUR MEMBERS. TRY TO FIND WHERE THE INDUSTRY BLOGGERS ARE SPENDING THEIR TIME. MEET THEM AT YOUR ANNUAL CONFERENCE AND NETWORK. SUPPORT THEIR MISSION AND THEY WILL SUPPORT YOURS. How many social networks should we participate on? MORE THAN ONE AND AS MANY AS YOU CAN PUT TIME INTO... I THINK OVER TIME S/N SITES THAT ARE USEFUL WILL RISE TO THE TOP. TAKE MI-FORUM, LOTS OF PLANNERS, BUT THE TOPICS ARE ALL OVER THE MAP AND DISCUSSIONS USUALLY SHORT. SO IT DROPS LOW ON THE LIST. How do you choose which social networks your organization will have a presence on? TRIAL AND ERROR -- SEE FIRST QUESTION AT TOP. How do you decide which ones you will make a commitment to participate regularly? YOU HAVE TO TRY TO CONNECT AND SEE WHAT THE RESPONSES ARE... I ALSO USE GOOGLE ANALYTICS TO TRACK INBOUND TRAFFIC TO MY SITE (REFERRING SITES)... THAT HELPS SOMEWHAT. When you initially jump in - did you do it as an individual versus organizationally? I'VE BEEN FOLLOWING MI-FORUM FOR 4 YEARS... 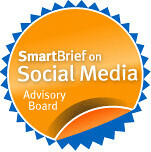 CONTRIBUTING HERE AND THERE... THEN THIS SUMMER I PLUNGED INTO SOCIAL MEDIA (RIGHT BEFORE ASAE IN SD). LINDY DREYER (SOCIALFISH.ORG) WAS A GREAT HELP ON TWITTER. I STARTED FOLLOWING THE ASAE LIST SERV LIKE A HAWK... AND MAKING MY VP OF SALES REPLY BACK (SINCE I AM NOT A FORMAL MEMBER). IT WAS MAINLY ME, THEN MY HYPE HERE AND THE CRAZE OF S/M GOT MY BOOS INVOLVED, THEN I FOUND ONE SALES REP HERE ACTIVE IN LINKEDIN... THREE MONTHS LATER, I AM FEELING GOOD ABOUT BEING ENGAGED WITH THE MARKET, THE MARKET ENGAGES ME (US). THUS, GETTING OUR ACCT REPS OUT THERE USING NON-TRADITIONAL TOOLS (S/N SITES) PROVIDING EDUCATION AND RESOURCES AND BEST PRACTICES VS "SELLING" IS A DEFINITE MUST. What did you learn. what questions did you want to answer from your "research"? WHO'S ENGAGED, WHAT INFO IS BEING SHARED ON THE SITE, DO PEOPLE ENGAGE ON LINKEDIN Q/A, IS LINKEDIN THE RIGHT TOOL, IS FACEBOOK THE PLACE FOR ASSNS (I DONT THINK SO! ), CAN WE ULTIMATELY SEE VALUE BY BEING CONNECTED (YES). WHEW.... FELT LIKE AN INTERVIEW ON CHANNEL 15 NEWS. My theory: you don't need to be ACTIVE everywhere at once, but you DO need to be PRESENT in as many places as possible. Use the majority of your social media outreach as a funnel back to your home base, if necessary, but deciding that you don't need a (business) profile on Site X is akin to saying "I don't want the business of the people on Site X." I tend to grab my username at most places that look interesting to me and set up a profile that points to where I typically "go deep". I don't think that companies need to use every space available but it's not a bad idea to gradually have a name in every space, even if you aren't using it to it's fullest every day. When asked by companies which spaces they should join, my answers is always well, what do you want to accomplish in social networking or what is your end goal. Wow this site is amazing I can't believe its completely free.. i didn't believe it at first but tried it because it was so easy to make money.. anyhow I made like 5 bucks in 5 mins of works and they paid me that night.. so this site is legit. Its seriously so easy to do you won't believe you are getting paid to do it.. Thanks for your article! I do work around strategic planning for nonprofits and am particularly interested in the best route for using social marketing as a tool for nonprofits engaged in activism. Would love to hear your thoughts!